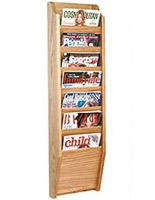 Vertically Mounted to Save Floor & Counter Space! 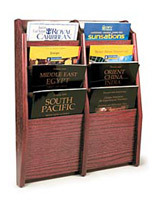 Stacked Design Holds Lots of Reading Materials! 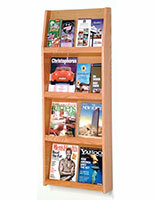 Wood Structure has Elegant Laminate Finish! 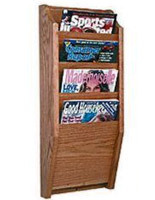 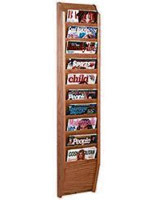 These medium oak literature holders that are magazine stands keep storefronts and offices tidy! 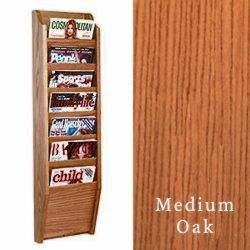 Constructed of a warm, medium oak laminate finish, these wooden fixtures take up only a small footprint, leaving floors and counters open for other business tools. 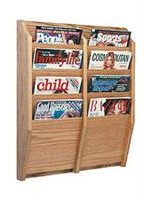 These medium oak literature holders, such as wood framework systems, have seven places for pamphlets or periodicals. 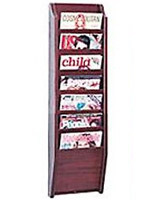 Buy fine wall hanging displays designed to reveal titles to capture customer attention. These medium oak literature holders, pamphlet mounts, can be same-day shipped when in stock, see ordering details.